There’s a myth in our industry that social media is the responsibility of one dedicated individual or a small team. The reality is that everyone in an organization can contribute to the success of a brand in social media, from the c-suite, to middle managers, to designers and developers. Teams that maximize participation in social media across the company can increase the number of opportunities reaped from socials and bring about results that extend beyond social media. One specific example of that is how social media can help get the attention of relevant media groups at the national or regional level. That’s what this post is about. In a recent Business Wire luncheon, I had the opportunity to sit down with reporters and editors from some of Oregon’s most popular news outlets to just ask them about their realities. We talked about how the industry is changing, how information is presented differently, how stations are hiring social media pros and so much more. The common thread through each of my conversations was that media are feeling pressure to a) have a social media presence personally and b) to think about creating content that will be shared in socials and beyond. The savvy PR pro could put two and two together here. The opportunity in public relations is to make our clients the go-to source for news that has legs online and in social media. 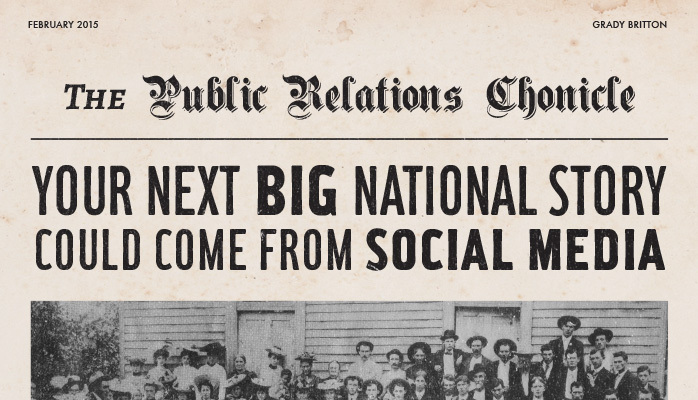 This is the first example of our commitment to social media as PR pros. At the start of any pitching brainstorm or campaign, we should be thinking about how to serve up news that makes reporters’ jobs easy. This means we should think critically about how to present information in a way that is share-worthy and position it as such with reporters. But, we’re ahead of ourselves. First, we need to get the attention of media. Depending on the contact, you could pick up the phone, email, catch them in-person (if you’re lucky), send a carrier pigeon, etc. But, few people try reaching out through social media. The first step in any case is to first have a social media presence. Here comes the second commitment to social media: get your social media presence on track. One of my favorite sayings goes, “The best time to plant a tree was 20 years ago. The second best time is today.” It doesn’t matter if you started a Twitter two years ago or if you don’t know what a tweet is. Make time for your own social media, because this is a platform you can use to engage reporters everywhere as they increasingly share and find news here. I’ve personally used to Twitter to secure briefings with major media such as Gawker, CNBC, Forbes and Time, among others, for my clients at Grady Britton. It works for national media, regional media, trades — you name it. There are fewer people using this method of outreach than email or phone. A quick pitch followed by a tweet may be the thing that sets you apart from others. These days, that’s half the battle to getting your clients the coverage they deserve. The caveat is that you must stay human. Social media is not just for pitching. Think of your profile as a digital representation of yourself. When you engage a reporter, check out their personal and professional tweets. If you’re not being slimy, you may find yourself indulging in a conversation about the latest episode of Scandal or Game of Thrones, and later you can talk about work. You may be surprised to find that the relationships and conversations you’d build in person can happen similarly over social media. 1) Think about creating news and sharing information in a way that will resonate online and in social media. Position your news this way with media. Make their jobs easier. 2) Start or revive your social media now. Use it to engage media, share news about your business and develop relationships that manifest in person. This will help you stand out.